Special Events or Luncheons/Demonstrations – when Where notable teachers and demonstrators from various schools around the USA and frequently the head of an ikebana school from Japan, are featured. guest/demonstrator. Members may bring guests to these elegant affairs. Annual Exhibition – when Our members exhibit their ikebana artistry and demonstrations are held for the public by the local schools. This event is held each year at the U.S. National Arboretum and is free. 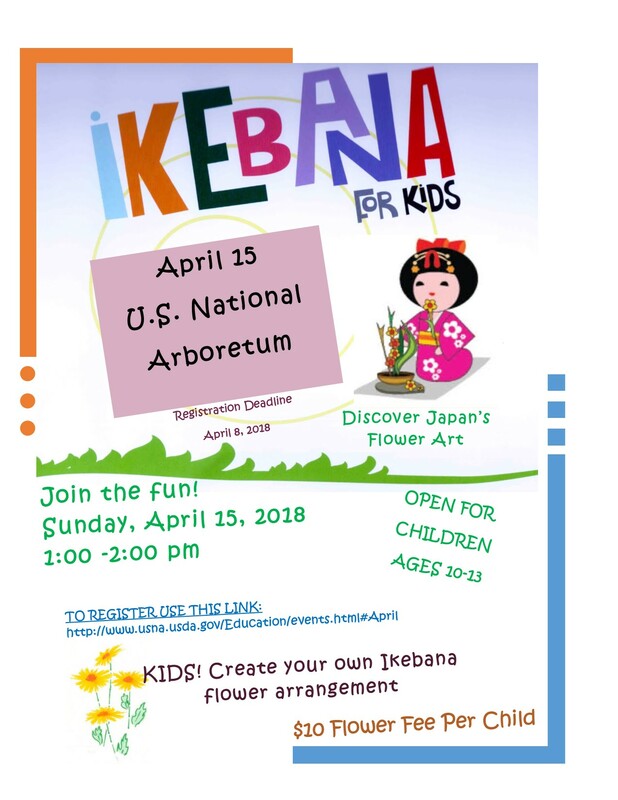 Ikebana for Kids – Classes for children of various ages are offered by our teachers a several venues and times during the year. The Annual Exhibition for 2018 was held on April 13 through 22 at the US National Arboretum. Please look here for more information. New in 2018 is a special event for kids 10-13 years old. We hope you can join us and introduce the young people to an enriching experience. Please refer to the sidebar menu to see the next scheduled Public Events. Ikenobo Luncheon Demonstration by Rumiko Manako, October 10, 2018. Pictures of this event are available on our Photo Gallery. Sogetsu Luncheon Demonstration by Diana Cull, June 20, 2018. Pictures of this event are available on our Photo Gallery. Ohara Luncheon Demonstration by Young Oh, March 24, 2018 are available on our Photo Gallery. As part of our 60th Anniversary celebrations, a luncheon demonstration featuring Valerie Eccleston, President of Washington, DC Chapter of Ichiyo School was held on March 25, 2017. Pictures of this event are available on our Photo Gallery. As part of our 60th Anniversary celebrations, a luncheon demonstration featuring Mika Tsujii, Head Teacher of Saga Goryu, was held on October 15 followed by Workshops on October 16, 2016. Pictures of this event are available on our Photo Gallery.